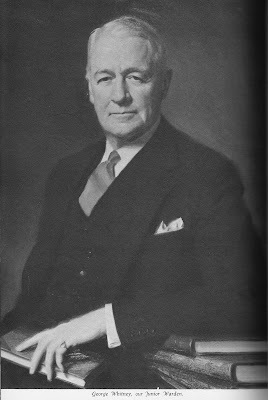 George Whitney. 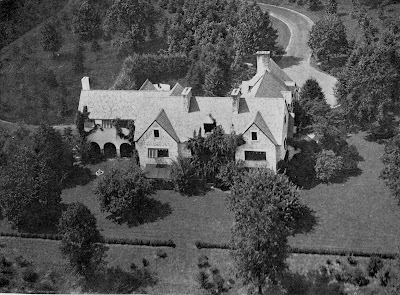 Below, his estate 'Home Acres' designed by Delano & Aldrich c. 1915 in Old Westbury. Click HERE for more on 'Home Acres'. Looks pretty much intact, with the exception of the white-wash....why do people do that? Though it doesn't look bad plain brick...but still. Zach, did Jennings Jr, ever send any of those photos of the interior? I'm surprised as to how many estates were off of I.U.Willets. Were there any West of Glen Cove Road before the MeadowBrook was built? I also wonder if there were any West on Hillside Avenue when I'm sure it was just a small country road. Here it is on Bing: http://www.bing.com/maps/?v=2&cp=qsv6sj8vyshz&lvl=19.47295239754158&dir=7.038228830020723&sty=b&where1=Old%20Westbury%2C%20NY&q=old%20westbury%2C%20new%20york&form=LMLTCC Not only is it unpainted brick now & the east loggia enclosed but a sizeable wing has been added to the west with a new loggia built at the end of that. Those two white clapboard structures plopped down right next to the main house, no real landscaping, & the string of vehicles in almost every Bing rotation makes me wonder if this is still a private residence. Correction: Not only is it unpainted brick now & the WEST loggia enclosed but a sizeable wing has been added to the EAST with a new loggia built at the end of that. Maybe I should stop priding myself on my good sense of direction? I'm not seeing it as unpainted brick on Bing, even in rotation. By the way, the colonial next door with the small pond in back is very lovely on Bing. However, it looks like it's being brutally butchered on Google Earth. Does anyone have any info on this place? Zach??? "the colonial next door with the small pond in back" - here? Nice view at Google Earth if you go back in time. "...it looks like it's being brutally butchered..."
Are you talking about this place? Because on Bing it is actually this place, which Zach blogged about not too long ago when it was on the market; guess someone snatched it up & tore it down ––– torches & pitchforks, anyone? Here is Home Acres on Bing, sans whitewash. The two new wings appear to more than double the space, but seem a little off-proportion to the main body of the house ––– perhaps it works from ground level? Or with the whityewash restored? Better expansion than demolition, non? Security word - diomsh: when a show horse breaks two legs on a jump. I wasn't even looking at Home Acres but at "Turnpike Cottage" behind Ivycroft and just east of Arlough's riding track. It's the white colonial with the pond just east of Turnpike Cottage I was curious about. ....This explains why I wasn't seeing red brick!!! And yes LGB, you are correct! LGB, I take that back. That link is a different house. The one I was referring to is the colonial behind Ivycroft. You must be seeing the final demolition aerials of Dunbar Bostwicks estate; they've "...paved paradise, and put up a parking lot..."
Actually, they razed the mansion, with its lovely octagonal room, and put up a couple of McMansions in it place. Hurry, hurry, the torches & pitchforks won't last for ever! Is anyone going to answer my question? Were there any estates West of Glen Gove Road and West on Hillside Avenue before the Meadowbrook? Anon 9:26, there were many...all the way through Roslyn, North Hills, Manhasset, Plandome and into Queens. I wish we had an old map....I'm sure there are so many mansions that we know nothing about and are lost to history. Thanks Zach. They've got 1906, 1914, 1927 and 1939.